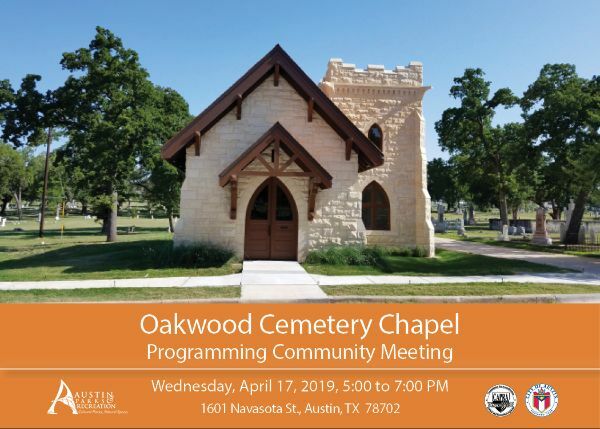 The Austin Parks and Recreation Department (PARD) invites the community to participate in a conversation about future programming at Oakwood Cemetery Chapel on Wednesday, April 17, 2019, 5:00 PM to 7 PM at 1601 Navasota Street, Austin, Texas. Constructed in 1914, Oakwood Cemetery was Austin’s first city cemetery and its oldest municipal burial ground. The Oakwood Cemetery Chapel sits within the Oakwood Cemetery, and is a City of Austin Historic Landmark, a registered Historic Texas Cemetery, and is listed to the National Register of Historic Places. Under the 2012 GO Bond funding for Cemeteries, PARD completed a full rehabilitation of this historically significant structure in 2018. Oakwood Cemetery is a space for locals and tourists alike to explore the history of Austin and Texas. Funding for Oakwood Chapel programming is provided in part by Hotel Occupancy Tax. Feedback can also be given online at SpeakupAustin.org/oakwoodchapel.